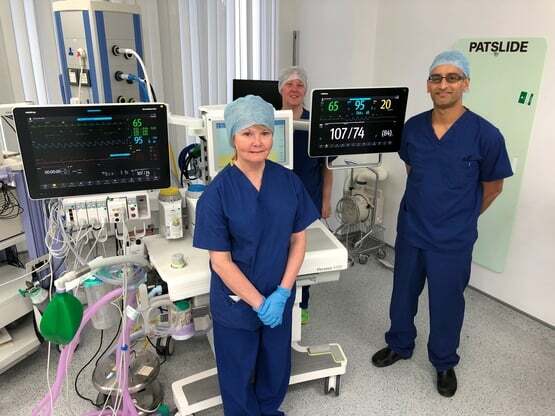 A new digital monitoring system that combines a patient’s vitals has been installed in operating rooms at Salford Royal NHS Foundation Trust. The system, which features a touch screen layout, is now fully functional across 20 theatres, replacing the Global Digital Exemplar (GDE) Trust’s original 20-year-old equipment. Patient data from operation through to recovery is visible on the screen, rolling the multiple monitoring systems previously used into one easily accessible device. Information on anaesthesia to heart rate can be viewed on the one screen. Global health tech company Mindray was awarded the contract to install its Benevision monitoring system throughout the Trust. Dr Joe Sebastian, consultant anaesthetist said: “The high definition screen integrates various technologies, such as depth of anaesthesia and cardiac output monitoring, onto one central view. “Patient data is now more easily visible and we’ve also freed up some space in theatre. The Trust further plans to install the monitors in the ICU, A&E, emergency assessment ward and at its Heart Care Centre, allowing clinicians to view patient data from the emergency department through to critical care on one platform. As part of its GDE programme, the Trust aims to have a fully digitised theatre and anaesthetic process by the end of 2019. The new monitors will be connected to the patient record system later this year. In April a new £2m anaesthetic management system will also be installed. Dr Gareth Thomas, Northern Care Alliance Group chief clinical information officer, said: “Full digitisation of the patient journey will improve patient safety and mean everything is recorded correctly. Other innovations introduced at the trust include a smartphone urine test for kidney patients and a diabetes prevention solution.